The onset of vision loss from SABRIL is unpredictable, and can occur within weeks of starting treatment or sooner, or at any time after starting treatment, even after months or years. Symptoms of vision loss from SABRIL are unlikely to be recognized by patients or caregivers before vision loss is severe. Vision loss of milder severity, while often unrecognized by the patient or caregiver, can still adversely affect function. The risk of vision loss increases with increasing dose and cumulative exposure, but there is no dose or exposure known to be free of risk of vision loss. Vision assessment is recommended at baseline (no later than 4 weeks after starting SABRIL), at least every 3 months during therapy, and about 3 to 6 months after the discontinuation of therapy. Once detected, vision loss due to SABRIL is not reversible. It is expected that, even with frequent monitoring, some patients will develop severe vision loss. Consider drug discontinuation, balancing benefit and risk, if visual loss is documented. Risk of new or worsening vision loss continues as long as SABRIL is used. It is possible that vision loss can worsen despite discontinuation of SABRIL. Because of the risk of vision loss, SABRIL should be withdrawn from patients with refractory complex partial seizures who fail to show substantial clinical benefit within 3 months of initiation and within 2-4 weeks of initiation for patients with infantile spasms, or sooner if treatment failure becomes obvious. Patient response to and continued need for SABRIL should be periodically reassessed. SABRIL should not be used in patients with, or at high risk of, other types of irreversible vision loss unless the benefits of treatment clearly outweigh the risks. SABRIL should not be used with other drugs associated with serious adverse ophthalmic effects such as retinopathy or glaucoma unless the benefits clearly outweigh the risks. Use the lowest dosage and shortest exposure to SABRIL consistent with clinical objectives [see Dosage and Administration (2.1)]. Because of the risk of permanent vision loss, SABRIL is available only through a restricted program under a Risk Evaluation and Mitigation Strategy (REMS) called the Vigabatrin REMS Program [see Warnings and Precautions (5.2)]. Further information is available at www.vigabatrinREMS.com or 1-866-244-8175. SABRIL is indicated as adjunctive therapy for adults and pediatric patients 10 years of age and older with refractory complex partial seizures who have inadequately responded to several alternative treatments and for whom the potential benefits outweigh the risk of vision loss [see Warnings and Precautions (5.1)]. 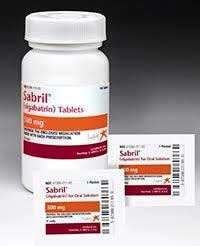 SABRIL is not indicated as a first line agent for complex partial seizures. SABRIL is indicated as monotherapy for pediatric patients with infantile spasms 1 month to 2 years of age for whom the potential benefits outweigh the potential risk of vision loss [see Warnings and Precautions (5.1)]. Use the lowest dosage and shortest exposure to SABRIL consistent with clinical objectives [see Warnings and Precautions (5.1)]. The SABRIL dosing regimen depends on the indication, age group, weight, and dosage form (tablets or powder for oral solution) [see Dosage and Administration (2.2, 2.3)]. Patients with impaired renal function require dose adjustment [see Dosage and Administration (2.4)]. SABRIL tablets and powder for oral solution are bioequivalent. Either tablet or powder can be used for CPS. Powder for oral solution should be used for IS; tablets should not be used for IS because of difficulty in the administration of tablets to infants and young children. Monitoring of SABRIL plasma concentrations to optimize therapy is not helpful. Sabril is given orally with or without food. SABRIL powder for oral solution should be mixed with water prior to administration [see Dosage and Administration (2.5)]. If a decision is made to discontinue SABRIL, the dose should be gradually reduced [see Dosage and Administration (2.2, 2.3) and Warnings and Precautions (5.6)].